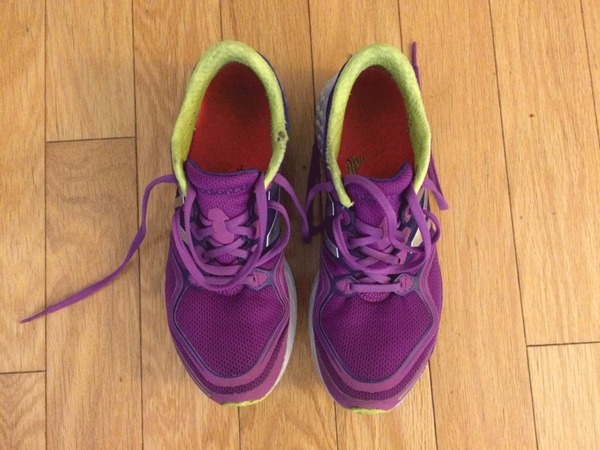 As Marine Corps Marathon training chugs along, my once-sturdy running shoes are wearing down. The tread is wearing and the magenta fabric is fraying. The shoes feel fine, but is it time to ditch them for another pair? Admittedly, I am not a fan of buying new shoes – I’m rather particular and I’ve been known to buy new shoes, run in them, fret that they “feel weird” and then return them. I mean, of course they “feel weird” – my foot hasn't imprinted into them. To quell my new-shoe queries, I turned to a D.C.-area shoe expert about when to get new kicks. Pacers Running Brand Specialist Stephen Laico offered tips, tricks and advice for the shoe-buying process. When should runners get new running shoes? Runners should typically get new shoes when they have put between 300 and 500 miles on that pair, Laico said. However, it is also dependent on the duration and frequency, he added. “Someone running five miles a week is going to go through their shoes a lot differently than someone who is training for a marathon and is putting in 25 to 50 miles a week,” Laico said. The runner’s form matter, too. “[It’s] going to vary based on how people strike – someone who has got a light, efficient gate is going to be on the higher end of that mileage. Someone who has got a really heavy foot strike or kind of scuff their foot when they land, wear through that quicker and be on the lower end,” he said. What helps extend the life of running shoes? Running on a treadmill absorbs some of the impact on the shoe. Laico said runners can get a little bit more life on shoes by running inside. Still there is one major way to give running shoes more time: Keep running shoes strictly for running. “Sometimes people come in and saying ‘I’ve barely run in these shoes and they have pretty much broken down.’ But they are also walking in those shoes every day and spending their day wearing them. So all the time on your feet is going to add up – it’s not just the time spent running in those shoes that adds to the wear,” Laico said. How many pairs of shoes should runners have? An average runner should have at least two pairs of shoes to cycle through, Laico recommended. Alternating through two pairs will give more life to each pair. Also, it can help to switch between runs if, during the summer particularly, shoes get wet or sweaty. Before a shoe is completely dead – when there is about 25 percent of life left – set it aside and save it for the times when you need to turn to the back-up pair, Laico recommended. Where and when should runners buy shoes? Laico recommends runners stop by a specialty running store where trained staff can examine your stride, shoe size, running style and more. Also, runners may want to consider stopping in to buy shoes after a longer run to see what their shoe needs are when their legs are tired. The staff can look at your gate under stress.